There is probably no tree that excites more interest when it flowers than the poinciana (delonix regia). With its spreading crown of ferny leaves and flamboyant show of bright orange to red flowers, it is a stunning summer feature in tropical and subtropical regions. 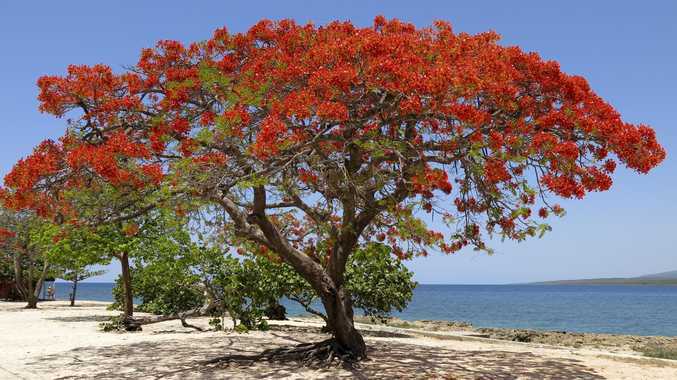 The poinciana is native to the dry forests of Madagascar. It is endangered in the wild, but its survival is assured thanks to the extensive planting of this spectacular tree throughout the world. Poincianas can grow up to 10m tall, but they usually don't get much taller than about 5m. The spreading canopy can be more than 10m wide, so this is not a tree for a small garden. It is a magnificent shade tree, and many were planted as street trees in the older suburbs of Brisbane. At this time of the year they are a blaze of colour. There is some variation in the colour of the blooms on different trees, and I'm not sure whether this is a result of the conditions or the genetic make-up of the individual specimens. All are orangey-red, but there does seem to be a range from bright orange to darker red. Poincianas are a legume, so, after flowering, they produce a seed pod that looks like a bean. And because these are big trees, the seed pods are big, too, up to 60cm long. Planting a poinciana is a commitment to the future; it can take 10 years for the tree to finally flower. They do grow fairly quickly, though, if you can keep the water and fertiliser up to them. A sunny, well-drained position, with plenty of room for the spreading canopy, is ideal. Your newly planted tree will grow more quickly if you enrich the soil with plenty of composted organic matter. Keep the area around it well-mulched to suppress the growth of lawn or any other plants that might compete for water and nutrients. Once the tree is established and has reached a reasonable size you can underplant with shade-loving plants. Poincianas are briefly deciduous, dropping all or most of the foliage in late winter and growing bright new leaves almost immediately in spring.